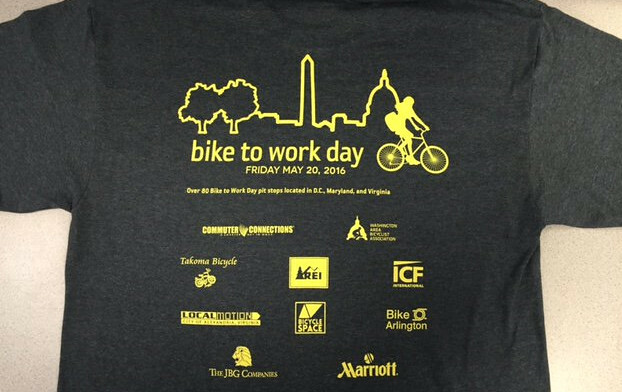 Posted on 05/19/2016 by Jeremy Bailey	in Around Town and tagged Bike to Work Day, Commuter Connections, free t-shirts, Washington Area Bicyclist Association. To promote healthy ways to commute to and from work, the 2016 Commuter Connections and the Washington Area Bicyclist Association are offering the annual Bike to Work Day on Friday, May 20th. You can visit 83 pit stops around DC (and in Virginia and Maryland). Each pit stop will have food, drinks, T-shirts and a chance to win prizes. Today is the last day to register! And you must register to receive a free T-shirt (and select a pit stop to pick it up). Register here.